The surface of many plants have a property known as superhydrophobicity, which prevents water from adhering to the surface and thus enables a important self-cleaning mechanism for the plant. When some of these plants are fully submerged under water, their surface carry with them small air-pockets into the water. The air-pockets can be retained under water as if they were stuck on the surface. The ability to retain air pockets under water is called submerged hydrophobicity. The attached air layer acts as a lubricant allowing water to flow over the surface with smaller resistance (compared to a surface with no air pockets). However, if the surface is set into motion or if it sunk too deep in water, the airpockets will quickly let go of the plant leaf and rise up to water surface. When this happens, the attached air layer is unstable to perturbations or large hydrostatic pressure. It turns out that some plants, for example the Salivina plant (shown in figure to the right), have surface textures that are able to preserve the air layer deep under water for a long time. 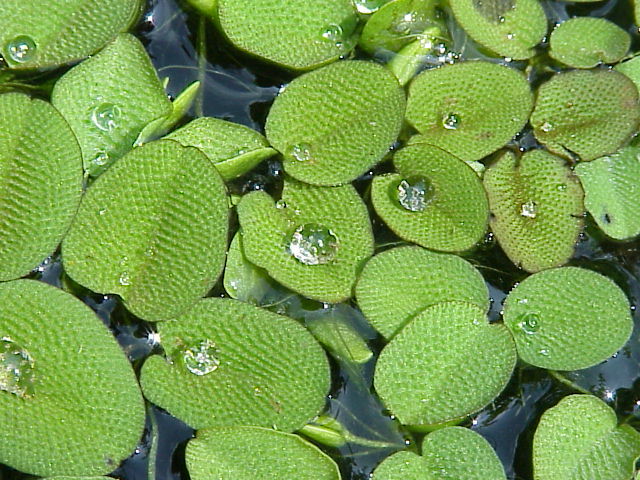 The surface of the Salvinia plant consists of elastic hairs (2 mm long) and have nanoscopic roughness (wax crystals) everywhere expect at the very tip of the hairs. It seems that the combination of elasticity, anisotropy and the multiscale texture of the Salivinia plant provides the plant a more robust air-preserving ability compared to most other plants. Inspired by the Salvinia plant, our aim is to create simple models of complex surfaces in order understand how elasticity, texture topology and chemical inhomogenity can be combined to design robust air-preserving surfaces, not only in static conditions, but also under unsteady shear and possibly turbulent conditions. In particular, we want to find answers to questions like: What is the role of the surface deformability in enhancing/reducing stability of the air pockets? How does the chemical contrasts (i.e. partial coverage of wax-crystals) of the texture increase the stability of the surface? The main challenge to create the models is to link the physiochemical processes taking place at nanoscopic length/time scales to the macroscopic length/time scales associated with the textured surface and fluid flow. For this reason, we combine molecular dynamics (MD) simulations with continuum models to understand across length scales. The models will be used to create a fundamental understanding of how a fluid flowing over a surface depends on the combination of underlying mesoscopic texture (e.g roughness, patterns, hairs) and the molecular details of the surface. The tools and the associated understanding from this project will in turn be used by other research projects to design robust and efficient surfaces that can interact with flowing fluids in a favorable way, for example to reduce fluid friction, increase heat transfer or fluid mixing.